Time to fulfill that “get creative” New Years resolution! 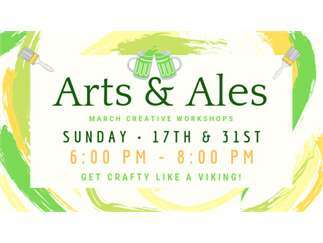 Come to Arts and Ales! In this March workshop, our talented instructor will be guiding you through painting a beautiful lavender backdrop with big, white flowers covering the space! You can make this your own using any colors you like! Learn how to paint this canvas for $25 per person! No experience necessary. Supplies are included! Workshop size is limited to 20 so get your tickets NOW!! Enjoy some mad great beer while you paint! Wine, Cider and non-alcoholic beverages are available too. We can't wait to see you at Mad Swede Brewing and what you will create!! Get crafty like a viking! Cost: 25 dollars a ticket gets you a seat and all art supplies!